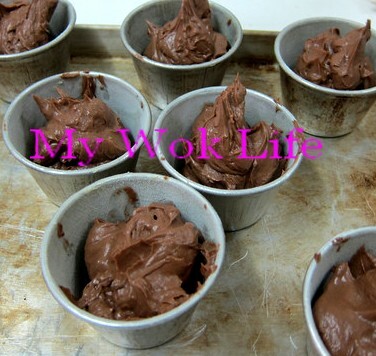 Remember I told you that I took up a baking lesson during my last Hong Kong trip back in Sep? 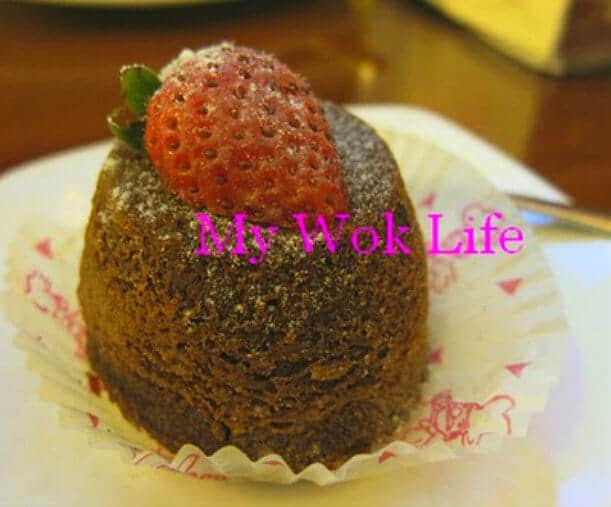 I went there to learn an iconic & famous chocolate dessert which is very popular in Hong Kong, the Chocolate Lava Cake Pudding aka Melting Heart. In Chinese word: 心太軟. Pronounced in Mandarin as “Xin Tai Ruan“, and In Cantonese, “Sum Tai Yun“. It literally means heart too soft. Just like the flowy chocolate lava in the cake, it’s soft and… melting.. Try to imagine you bake this “Melting Heart” dessert for your loved one and he/ she feels so touching with his/ her heart melting to your love… Ahh…. (smile). So, I thought I shouldn’t delay this posting anymore, but to share the recipe with you guys. To get it prepared and baked for this coming heart warming season, Christmas day! 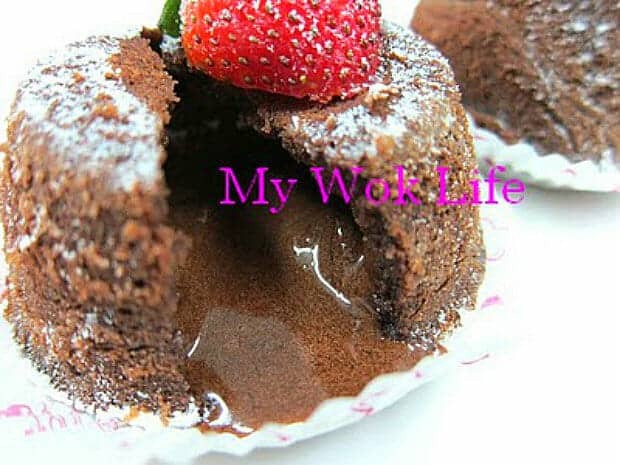 This chocolate cake pudding is definitely very suitable to be baked during this festive season. Present this adorable and delicious cupcake-sized sweet treat (instead of the usual log cake) to him/ her after a romantic dinner, and it will surely make a statement in your celebration this Christmas! 2 tablespoons of raisins (about 40-50 raisins), soaked in 2 tablespoons of dark rum for 30 minutes or longer. 1) Break eggs, add flour and sugar into a large mixing bowl. Beat with hand mixer or eletrical mixer at high speed till well blended, for about 3 – 4 minutes. Stir occasionally to prevent uneven mixture. 2) Add in butter and melted chocolate. Continue to beat till mixture is well blended, for another 3 minutes or less. The texture of the mixture should be creamy now. 3) Preheat oven at 200°C, for about 15 – 20 minutes. In the meantime, prepare for the baking cups. Use a small brush, lightly grease each cup with butter. Then, lightly dust the cups with flour. *How you do the dusting is: Place half a teaspoon of flour in a cup. Tilt and hold the cup 45°, and then, roll it all-round to coat the flour on all area of the inner side. Pour out the excess flour and tranfer to the next cup for dusting till all cups are done. 5) Put all the cups on a flat baking tray and place on the middle rack of the preheated oven. Bake for 5 – 7 minutes. 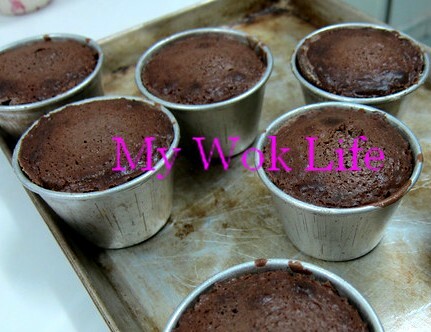 6) Remove cup cakes from the oven and let it cool outside the oven for 5 minutes. 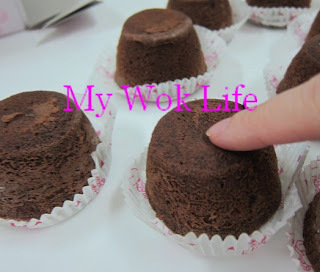 Then, turn over the cup cakes and place each cake on a sheet of round cup cake paper. Remove the cakes from the baking cups. So, the top of the cakes should be facing down on the cup cake paper. 7) Lastly, decorate the ‘top‘ of each cake. Dust some snow sugar on the cakes, using a small strainer to create snowy feel. Then, top 1 half strawberry on it. Ready to serve. It is best to consume immediately or within an hour after baked so that the melting effect in the heart of the cake will remain flowy. Otherwise, reheat the cakes in microwave to regain melting lava effect. 1 cup-sized cake of my chocolate lava cake pudding counts about 360kcal. Tips: You may pre-soak the raisins in dark rum overnight. Put them in a glass container, and store in the refrigerator before the use. 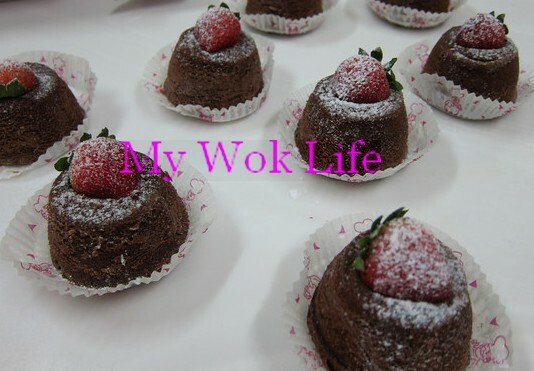 *Use of snow sugar aka snow powder is better than icing sugar as it will not melt easily. * If you prefer making one single cake, substitute 8 baking cups with 1 single 6″ heart-shape baking tin. Recipe remains the same. ** The effect of melting lava inside the cake will only remain runny for less than an hour, or it will be less lavaish and more or less set after a while. However, this will not affect the taste of the cake. Go ahead to reheat the cake before consume! I love this lava cake, baked for last yr xmas too :). Merry Christmas and Happy New Year to you and your family! in step 5 you mentioned about the toothpick inserted should come out clean. this is a lava cake and i don’t think a toothpick should be inserted at all. you also mentioned combining all 8 cups to make a single cake. i’m sure it works but the lava effect will be gone.